Lava Ultramafic Flex Cable 1/4in. - 1/4in. Angle - Angle 25 ft. The Ultramafic Flex is Lava Cable’s newest high end cable and a more flexible version of their Ultramafic Cable. It is a low capacitance cable featuring two low strand count 20 gauge sliver plated copper conductors, triple shielding and a 98% braided shield. The Ultramafic Flex provides superior noise and RF rejection. Each cable comes standard with Neutrik X-Series plugs to include a silent plug. 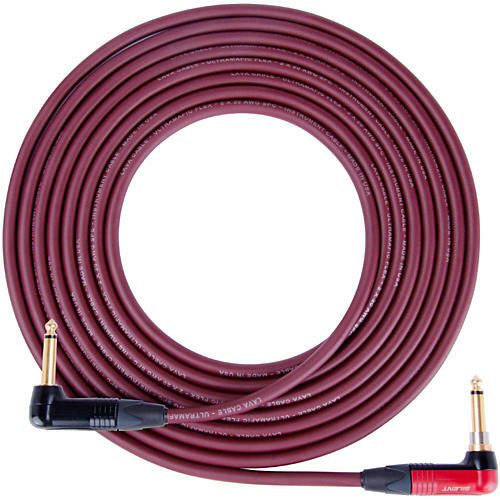 This cable provides excellent frequency response and excels particularly for gain tones. The raw cable is made in the USA and assembly is done at the facility in Owasso, OK.